"XC" as it is known by those in the sport takes place during the fall and features distance racing. The freshmen race 1.5 miles and the varsity compete at both the 2.5 and 3.1 miles. Most races give medals to a top percentage of athletes that have entered the race. Some races have as many as three hundred in a race. Some of the top invitationals and all championship meets keep point totals to declare team champions. The scoring is quite simple as each place receives a point. First place = 1 pt, 20th place = 20 pts. At each meet, the varsity "A" team consists of the top 7 fastest runners. In a scoring meet, the top 5 places (of 7) are added up and totaled. So if our top 5 finish in 1st, 3rd, 5th, 6th and 10th we would have 25 pts. The lowest point total wins. In the event of a tie, the tie would be broken by each team's 6th place finisher. The key to a sound cross country team is team balance. Each freshmen should be prepared to practice after school Monday-Thursday from 2:45-4:30 PM. As we move into October; practices will end at 4:45PM. Friday's are usually team meetings and for our freshmen we try to keep Friday in a classroom environment to learn about the sport. Your son should be properly prepared for the weather conditions because we will run in all weather except thunder and lightning. Each athlete should have running shoes, shorts and a light shirt in addition to a water bottle. Cross Country is a vigorous sport in which young men are changed into disciplined young adults due to nature of the training. We start our first freshmen workout with a three minute run. At the end of the cross country season we GUARANTEE your son will be able to run for 1 HOUR (without stopping) as his final workout of the season. This obviously can only happen if your son is at practice. This is an inclusive sport but those who aren't dedicated are cut from the team. Our local allegiance is to the NY Archdiocese (or NY Section) consisting of 18 teams in Staten Island, Westchester, Bronx and Manhattan. There are other sections as well such as the BQ Archdiocese which includes teams from Brooklyn and Queens. The third section is the Nassau-Suffolk Archdiocese which features Long Island teams. When all of the Sections get together for a championship it is called the CHSAA Intersectionals (literally between sections) The Catholic School league has 35 schools in its membership. 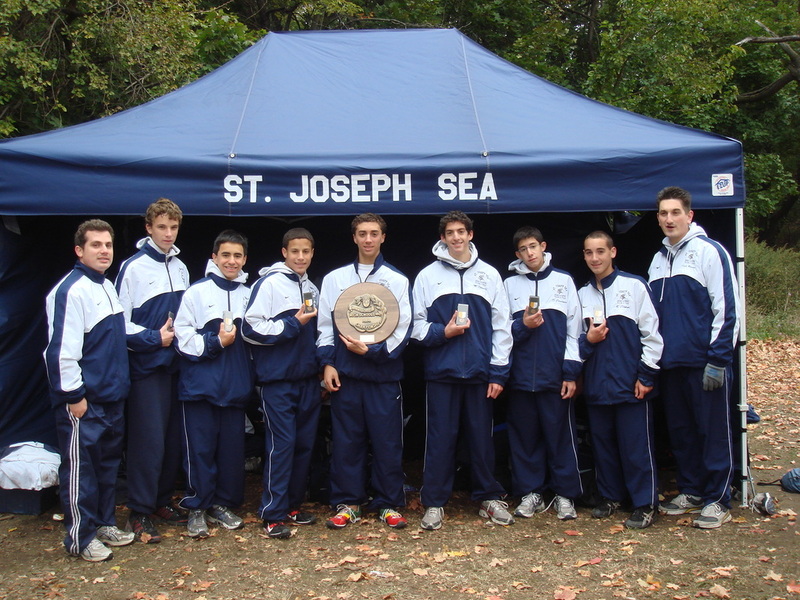 The CHSAA Intersectionals serves as a qualifier to the NY State Championships. The "meets" usually take place on Saturdays and occasionally during the week. Most of these meets are at Van Cortlandt Park. Bus service is provided for all travel meets. The athletes are told to meet at a certain time and Lombardi Time (15 mins prior to bus departure) in the front of the school. Any athlete that misses a championship meet without consulting a coach will be asked to leave. Freshmen are to compete in Sea Gym shorts (purchased in the book store) and the freshmen cross country t-shirt ($10) which is sold during the season. Note: No matter how many times your son says he doesn't want to see you at a meet, he would be happy if you came. Obtain a copy of our schedule and try to attend a meet. The most popular meets are the Luke Parlatore Invitational and SI Champs which are held at Clove Lakes Park on Staten Island.